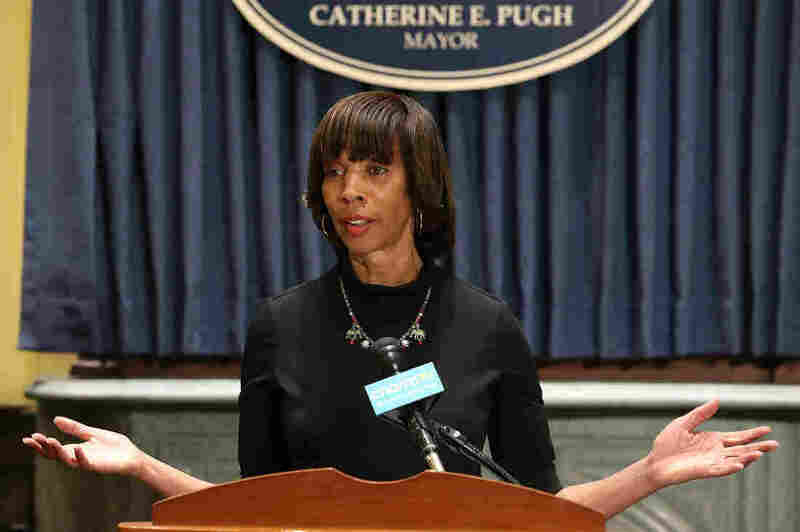 Baltimore Mayor Catherine Pugh Takes Leave Amid 'Healthy Holly' Scandal Baltimore Mayor Catherine Pugh is embroiled in a political scandal involving hundreds of thousands of dollars for her self-published children's books. She says she needs to "focus on her health." Baltimore Mayor Catherine Pugh's office says she needs to take time to recover from pneumonia. This comes as she is dealing with a scandal involving hundreds of thousands of dollars for her self-published children's books. Baltimore Mayor Catherine Pugh announced she is dealing with health challenges and will take an "indefinite leave of absence" at the same time her office is engulfed in a scandal involving the profits from her self-published children's books. Pugh's office released a statement late Monday afternoon saying that she has been fighting pneumonia "for the past few weeks" and that her doctors advise her to "focus on her health." The statement continued, "Mayor Pugh will be taking an indefinite leave of absence to recuperate from this serious illness." For weeks, Pugh, a Democrat, has been the focus of criticism surrounding her Healthy Holly children's book series about a black girl who promotes nutrition and exercise. Just before she announced her leave of absence, The Baltimore Sun reported that health care giant Kaiser Permanente was seeking a contract to provide coverage to city employees and paid $114,000 to purchase some 20,000 copies of the books between 2015 to 2018. The city's spending panel, of which Pugh is a member, awarded a contract worth $48 million in 2017 to Kaiser Foundation Health Plan of the Mid-Atlantic States Inc., according to the Sun. The mayor, according to the paper, "does not appear to have abstained from voting on the contract." Last month, the Sun also reported that Pugh profited from business contracts with the nonprofit University of Maryland Medical System, which runs hospitals around Baltimore. Pugh was a board member of UMMS until her resignation on March 18. Two other board members resigned a day earlier. "Under the deal with the medical system, UMMS paid Pugh $500,000 for copies of the books while she served on its board. UMMS paid $100,000 in each of five transactions in 2012, 2013, 2015, 2017 and 2018 to purchase 20,000 copies of her self-published books at $5 per book. At a news conference last week, Pugh apologized for doing "something to upset the people of Baltimore," saying she never intended to do "anything that could not stand up to scrutiny." In her statement announcing her leave, Pugh made no mention of the scandal. Baltimore's Charter states that Baltimore City Council President Bernard "Jack" Young will take over mayoral duties. The change in power goes into effect at 12:01 a.m. Tuesday. In a statement of his own, Young called the mayor's leave "temporary" and said he understands how "traumatizing" the saga has been for the people of Baltimore. "I am utterly heartbroken by the developments that have unfolded over the past several weeks. I pray that Mayor Pugh continues to recover from her illness," Young said in the statement. He also vowed to be a "stabilizing force" and promoted himself as someone who takes his "responsibilities seriously." In an earlier version of this story, we mistakenly said that Baltimore Mayor Catherine Pugh had resigned. She is actually taking a leave of absence. Additionally, we also said that she resigned from the board of the University of Maryland Medical System on March 20. The date was actually March 18.